Of course this doesn’t apply to everything. Some events are clearly evident after they’ve happened. For instance a natural disaster that destroys homes, forests and even cities. No questions need be asked there. I can recall watching the first space shuttle launch whilst sitting in a classroom at the age of 11. It was awe inspiring to imagine that the people inside were on their way into space. Wow! Now despite seeing it on television I had no reason to doubt whether it was real or not. Back in 1969, on July 20th to be precise, the world experienced a very major event. Millions of people around the globe witnessed it, albeit not in person, but none the less it’s a moment that cannot be forgotten. As I wasn’t born at the time I can only imagine how it must have felt. You may have twigged that it was the day that NASA achieved the incredible, or may be that should be the impossible. Astronauts actually walked on the surface of the moon and Neil Armstrong spoke those defining words “That’s one small step for a man, one giant leap for mankind.”. Sounds amazing when you think about it, remember it was in 1969. Given the rapid development of technology over the past few decades the belief is that everything is possible. Some people however are not so convinced. Since that day occurred the world has been full of people who refuse to believe that NASA achieved this goal. Basically they are accused of faking the whole thing, but when you think about it how could NASA have ever proved that it did actually happen? They couldn’t have a jury all sitting on the moon ready to take note for example. Well, finally NASA have released what they deem to be proof. Well they say its proof, but to be honest I’m not so sure that it makes a blind bit of difference. It’s a collection of images taken from 13 miles above the moon’s surface. Odd that, surely after over 40 years they could’ve moved a little closer, or used a better camera may be? The Hubble Space Telescope manages to generate hi-definition images of the entire universe in outstanding clarity. So something doesn’t seem to add up here. As the images aren’t exactly clear it’s handy that they’ve pointed out the moon buggy tracks, the mission debris and even footprints left by Buzz and co.
It’s all a little puzzling though… if it never happened then why try and prove it all now with images that are worse than I could produce in Photoshop, or take with my mobile. Similarly if they really did step foot on the moon then why release these images at all. Is it all just a cover up? President Kennedy gave the directive to NASA to put a man on the moon before the end of the 1960’s. They achieved this with less than 6 months remaining. Some theorists say the claim was made to ensure that America went down in history as being the first to do so. OK, so let’s be honest. The only way it will ever be proven is if someone else goes to the moon. Other than America of course, and this is where Japan come in. It is believed that Japan is aiming to head to the moon during the next decade, with a plan to start building a moon base in 2030. A “Moon Base”… that sounds so cool. So I guess we won’t have to wait long to find out. Unless they do a deal and claim they’ve landed elsewhere on the surface. I mean, who could prove otherwise? So was NASA just trying to win over the Earth’s population in the short term? I doubt that very much. Were they claiming to have done it just to be credited as the first? I doubt that too. One thing, they did bring a sample of moon rock back to Earth, so that’s proof isn’t it? No you’re right, I guess it isn’t, and to be fair I’m not sure what else NASA could’ve brought back. It’s just a shame it’s only rock. After all, we have rock. Something more mind blowing or convincing would have been good. For instance, a state of the art as yet unreleased Sony 4D television, or perhaps a flying automobile with a traffic avoidance system that isn’t due out for another 20 years. 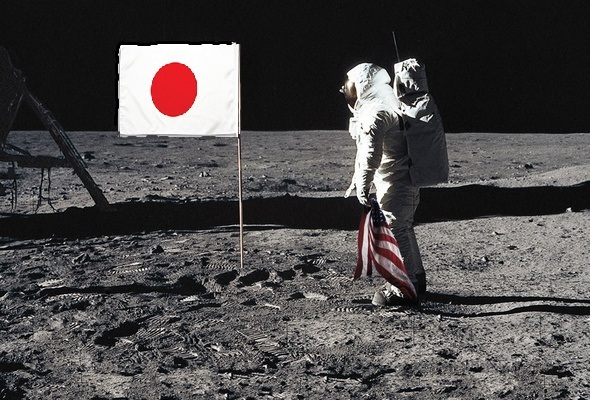 Oh hang on a minute… sorry, Japan haven’t landed yet have they? Or have they? Ok, well how about an alien… they’re much better than rock after all. But then for all we know they may well have done just that… spook! And he could be in Area 51 right now… whatever that is. 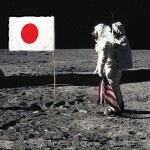 This entry was posted in Knowledge, Travel and tagged America, Cajuzi, Japan, Moon, NASA, Proof. Bookmark the permalink.